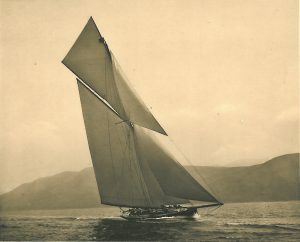 Sir Thomas Lipton, Bart (Shamrock III). Was born in Glasgow of Irish parentage in 1850. 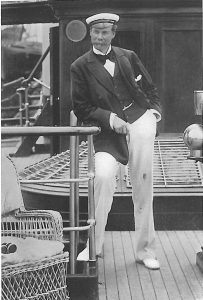 He is Chairman of Lipton’s, Ltd., and a Lieutenant of the City of London. He owns large tea estates in Ceylon. 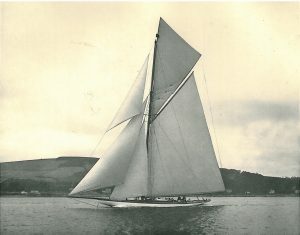 He raced unsuccessfully with Sham­rock I., Shamrock II, and Shamrock III. for the America Cup, which interesting events are touched upon in the Historical section of this work. 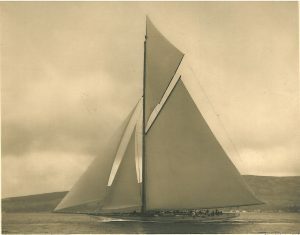 Sir Thomas has offered prizes for competition among American yachts, including the Lipton Ocean Cup of 1906. He is the owner of the s.y. Erin, 1,242 tons. Clubs: Royal Clyde, Royal Cork, Royal London, Royal Northern, Royal Temple, Royal Ulster, Gourock, New York.